(AFP) DAMASCUS, Syria — Syrian President Bashar al-Assad said Sunday his forces must push on with their campaign to retake the besieged enclave of Eastern Ghouta from rebels, despite mounting international calls to end the bloodshed. Assad’s forces have seized over a quarter of the enclave on Damascus’s eastern edges after two weeks of devastating bombardment, according to a war monitor. As the United States, Britain and France stepped up pressure on Damascus and Moscow to call off the assault, the United Nations said it plans to deliver much-needed humanitarian aid to Eastern Ghouta’s residents. “The majority (of people) in Eastern Ghouta want to escape the embrace of terrorism. 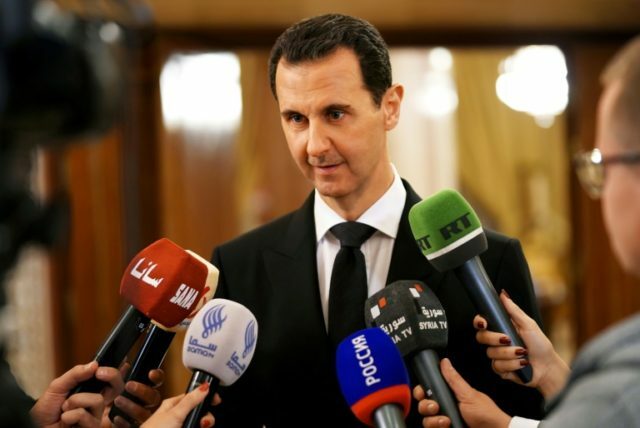 The operation must continue,” Assad told journalists in remarks broadcast on state television. Regime backer Russia last week announced daily five-hour “humanitarian pauses” in Eastern Ghouta. But while the air campaign has eased, fighting has intensified on the ground. Assad said civilians would still have “the possibility” to evacuate the enclave, while denying there was any contradiction between a truce and ongoing fighting. His remarks came as the Syrian Observatory for Human Rights said regime air strikes on Eastern Ghouta killed 34 civilians including 11 children on Sunday. The Britain-based monitoring group said earlier that regime forces had advanced to within three kilometers (two miles) of Ghouta’s main town, Douma, after retaking “more than 25 percent” of the enclave. The advance on the back of 15 days of air strikes, artillery fire and rocket attacks that are reported to have killed more than 650 civilians sent hundreds into flight to western parts of the enclave. The United States issued a statement Sunday condemning the two-week-old assault, and accusing Moscow of ignoring a UN Security Council resolution calling for a 30-day cessation of hostilities. Earlier Sunday, US President Donald Trump and British PM Theresa May said Russia and Syria were responsible for “heart-breaking human suffering” in Eastern Ghouta. With the support of Russian warplanes, the Syrian military has advanced on several fronts, retaking control of farms and villages, a military source told state media. The source said government forces seized a number of districts including Al-Nashabiyeh and Otaya, and had “eradicated terrorist groups” on the eastern outskirts of Damascus. They have reached the center of the enclave, to the edge of Beit Sawa, according to the Observatory. Rami Abdel Rahman, head of the Syrian Observatory, said at least 12 regime fighters had been killed in two areas, Al-Rihan and Shifoniya, in overnight clashes with the Jaish al-Islam rebel group. Jaish al-Islam shares control of rebel-held parts of Eastern Ghouta with Faylaq al-Rahman and Ahrar al-Sham. Hamza Bayraqdar, a spokesman for Jaish al-Islam, tweeted that the group’s forces had launched “surprise attacks” against regime positions. The Observatory, which relies on a network of sources on the ground, said rebels had retaken some parts of Shifoniya. An AFP correspondent inside Eastern Ghouta saw hundreds of civilians on Sunday fleeing from the town of Beit Sawa in the southeast of the enclave. The Observatory said some 2,000 civilians had fled regime shelling and clashes in eastern areas to western parts of the enclave. “Everyone is on the road. There’s destruction everywhere,” said 35-year-old Abu Khalil, carrying a little girl in his arms wounded on the cheek. Apart from the civilian losses, at least 76 pro-regime fighters and 43 rebels from Jaish al-Islam have also been killed in clashes since February 25, the Observatory says. Encircled by regime-controlled territory and unable or unwilling to flee, Eastern Ghouta’s 400,000 residents have suffered one of the most ferocious assaults of Syria’s civil war. Under siege since 2013, they had already been facing severe shortages of food and medicine. The region’s over-burdened medical workers have been struggling to cope. While falling short of the 30-day ceasefire demanded by the UN, Russia’s announcement last week of daily humanitarian pauses in fighting had raised hopes of some aid deliveries and evacuations. A convoy of “46 truckloads of health and nutrition supplies, along with food for 27,500 people in need” would finally enter the battered enclave on Monday, the UN Office for the Coordination of Humanitarian Affairs said. OCHA said further deliveries would follow and that it had “approval” to help 70,000 needy residents. Moscow has offered safe passage to non-combatants wishing to leave Eastern Ghouta during the pause, but no Syrian civilians have left the enclave since the first break in fighting took effect on Tuesday, the Observatory says. Damascus and Moscow have accused rebels of preventing civilians from leaving. French President Emmanuel Macron called on his Iranian counterpart Hassan Rouhani to put the “necessary pressure” on Syria’s regime to halt “indiscriminate” attacks on civilians. The UN’s regional humanitarian coordinator for Syria, Panos Moumtzis, sounded the alarm over the increased violence. “Instead of a much-needed reprieve, we continue to see more fighting, more death, and more disturbing reports of hunger and hospitals being bombed,” he said. As Syria’s conflict this month approaches its seventh anniversary, Assad’s forces, heavily backed by Russia, have retaken most of the territory once lost to rebels.